The Democratic Alliance condemns the lack of planning, consultation and efficient communication by the Department of Education in the closure of Rietbron Primary School in Rietbron. The school had 43 learners in total and was identified as non-viable due to enrolment decline. Rietbron Primary School’s Principal was allegedly informed by the Graaff-Reinet District Office in November last year that the school would not be closing down yet it had emerged in 2016 that the school was amongst those identified for closure in 2017. It is alleged that on 24 January 2018, the Principal was informed by the Graaff-Reinet District Director that they would have to close down the school on 12 February, which would give them approximately two weeks to prepare for the closure. She was informed that the two teachers who were on the Department’s payroll would have to move to a nearby school called Bronville. Allegedly, no arrangements were made by the Department for this move. The remaining two teachers who were paid by the School’s Governing Body (SGB) are currently unemployed, it is alleged that no redeployment arrangements were made by the Department. 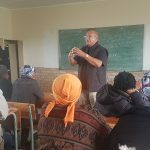 Out of 43 children, 10 moved to Bronville Primary School as this is the only other school option in Rietbron, the rest of the learners moved to schools in Willowmore (approximately 70 kilometres away) and Fort Beaufort (approximately 409 kilometres away). The Department allegedly did not make arrangements for these moves; parents were forced to move their children to these schools as well as arrange transport for them. It is clear that the school rationalisation process in our province has been implemented without proper planning. There are instances where learners from Xhosa medium schools have to be sent to Afrikaans medium schools and vice versa; these learners struggle to adapt to their new learning environments. The Education Portfolio Committee in the Eastern Cape has recommended that a moratorium is placed on the rationalisation and realignment of schools until a clearly defined plan is presented to the committee.